Granny Smith apples are full of antioxidants that improve health. You already know fruit is an indispensable part of your diet, and Granny Smith apples are one of the healthiest choices you can make. With a distinct tart flavor, they’re among the lower-sugar fruits you can eat, and they’re loaded with fiber and phytonutrients that benefit your health. Eat’em on their own or include them in healthy recipes to reap their benefits. Like most fruit, Granny Smiths are relatively low-cal. A 5-ounce apple has 70 calories, which makes it easy to fit into virtually any calorie-controlled diet. Most of those calories come from the apple’s 17 grams of carbohydrates, made up primarily of natural fruit sugar. Fruit sugars are a good source of fuel, so chomping on a Granny Smith apple can provide a modest energy boost to get you through a 3 p.m. slump or prepare you for a tough workout. However, Granny Smiths are slightly lower in carbs than other varieties of apples – about 3 grams less, on average. If you’re following a moderately low-carb diet, Granny Smith apples are a great choice. Where Granny Smith apples shine is their fiber content. Each apple has about 3 grams of fiber, which covers roughly 12 percent of the daily recommended fiber intake for women and 8 percent for men. Fiber is important for maintaining a healthy weight, because it makes your food more filling without contributing to its calorie count. Eating fiber-rich meals also helps manage your cholesterol levels, and a diet rich in fiber supports healthy digestive health, fighting constipation and other digestive problems, like diverticulitis. Granny Smith apples are also a good source of beneficial plant compounds, called phytonutrients. Phytonutrients offer a range of health benefits, from anticancer properties to antioxidant functions that protect your cells from genetic mutations. 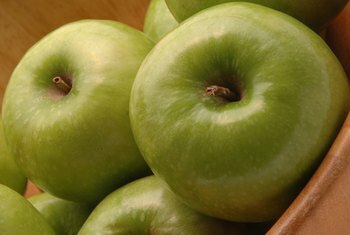 Granny Smith apples might have particularly potent antimutation properties, according to a study published in the Journal of Food Science in 2016. When the researchers studied the antimutagenic potential of a range of apples, Granny Smiths came out on top, besting popular varieties like Red Delicious and Royal Galas. While you shouldn’t read too much into test tube studies like this one – since they aren’t as accurate as human studies – it does hint that Granny Smith apples might offer special health benefits due to their phytonutrients. Granny Smith’s tartness is the most distinct part of their flavor profile. That means you can include them in healthy recipes to add a little bit of extra sweetness without adding too much. Add chopped Granny Smith apples to bran or whole-grain muffins for potent pops of flavor, or use thinly-sliced apples to top your cereal or smoothie bowl. Green apple also makes a great addition to smoothies if you want to limit your sugar intake. Blend them with coconut water, baby spinach, avocado and cucumber for a veggie-packed smoothie that’s high in nutritional value and relatively low in calories and carbs.